2019 Topps Series 1 Baseball Factory Sealed HOBBY JUMBO 6 Box CASE-18 AUTO/RELIC. This Product Every Year is ALWAYS A HOME RUN! We are Very Proud to offer this Super Hot 2019 Topps Series 1 Baseball MASSIVE Factory Sealed HOBBY JUMBO CASE! This Factory Sealed HOBBY JUMBO CASE includes SIX(6) Factory Sealed HOBBY JUMBO Boxes! EACH of these ENORMOUS Factory Sealed HOBBY JUMBO Box includes 10 Packs and 46 Cards Per Pack for a Total of 460 Cards! Plus Each Awesome Factory Sealed HOBBY JUMBO Box includes THREE(3) AUTOGRAPH or RELIC Cards! 2019 Topps Baseball Series 1 Celebrates the 150th Anniversary of Professional Baseball! Look for all-New Inserts, Autographs &Relics with additional Parallels throughout this Iconic Release! Collect all 350 Base and 350 Numbered Parallel Cards including 1 of 1 Platinum Parallels & Printing Plates! Look for New Inserts, Parallels & Autographs including 1984 Topps Baseball, Iconic Card Reprints, Cactus League Legends, Grapefruit Legend Cards, 150 Years of Professional Baseball, Revolution of the Game & More! Look for Autographs of Current MLB Superstars including Mike Trout, Aaron Judge, Shohei Ohtani, Bryce Harper, Ronald Acuna & Many More! Plus Look for Autographs of MLB HOF Legends including Derek Jeter, Sandy Koufax, Chipper Jones, Ichiro, Mariano Rivera, Frank Thomas, Hank Aaron & Many More! 2019 Topps is Loaded with ROOKIE Cards! Look for Rookie Cards & RC Autographs of Kyle Tucker, Cedric Mullins, Jeff McNeil, Taylor Ward, Justus Sheffield, Brandon Lowe, Chance Adams & Many More! Look for Major League Material Autograph Cards, World Series Champion Autograph Relic Cards, Postseason Performance Autograph Relic Cards, Legacy of Baseball Autographs & More! Look for Amazing HOBBY EXCLUSIVE Topps Reverence Autograph Patch Cards & Parallels , Sketch Cards, Retro Hat Logo Patch Cards, 150 Anniversary Commemorative Medallion Cards & More! This Product is Absolutely Loaded! Good Luck with your Pulls! We stock a Huge Selection of Factory Sealed Boxes from every Sport! Plus the Largest Collection of Graded Cards in the World! Be Sure to Check out our 1,000? S of other Items for Sale. Wait to pay until all items have been won OR 3 days after oldest item was won. (Please Note - we are not open on the Weekends and Holidays). We will NOT list a lower value or mark orders as gifts. We answer all emails within about 24 hours, Monday through Friday, and work to resolve all problems as quickly as possible. Unless an item is damaged, it generally needs to be in the condition it was received, either undamaged or factory sealed, to be eligible for a return. Note on Factory Sealed Boxes and Cases and Graded Cards. S samples and are not guaranteed to be in any particular box or case. On Listing for Beckett BGS Graded Cards. - Vendio Counters are active content free. 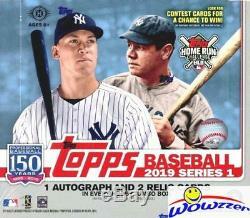 The item "2019 Topps Series 1 Baseball Factory Sealed HOBBY JUMBO 6 Box CASE-18 AUTO/RELIC" is in sale since Monday, February 4, 2019. This item is in the category "Sports Mem, Cards & Fan Shop\Sports Trading Cards\Baseball Cards".